↑ "2011 Census - Built-up areas". ONS. Retrieved 6 May 2014. ↑ "Grid Reference Finder". gridreferencefinder.com. ↑ Roach, Peter; Hartman, James; Setter, Jane; Jones, Daniel, eds. (2006). Cambridge English Pronouncing Dictionary (17th ed.). Cambridge: CUP. ISBN 978-0-521-68086-8. 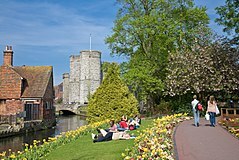 ↑ "Canterbury | The Southeast Guide". Rough Guides. 1 June 1942. Archived from the original on 22 January 2013. Retrieved 26 March 2013. ↑ "Girne American University Canterbury". www.gauc.org.uk. Retrieved 29 December 2015. ↑ Lyle 2002, p. 16.